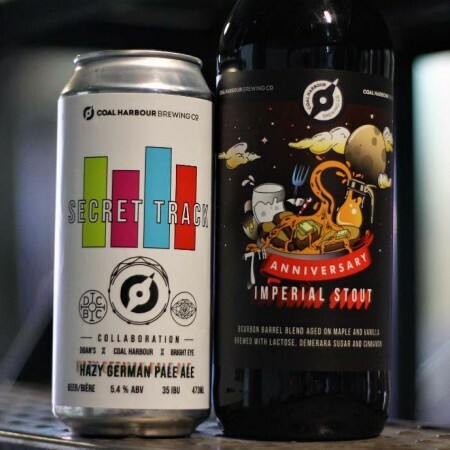 VANCOUVER, BC – Coal Harbour Brewing has announced release of a beer to mark its 7th anniversary, as well as a collaboration with fellow B.C. breweries Doan’s Craft Brewing and Bright Eye Brewing. French Toast was the inspiration for this rich and silky imperial stout. Brewed with roasted chocolate malt, lactose, demerara sugar, and cinnamon. A portion was bourbon barrel aged while the rest sat on hard maple wood, and Madagascar bourbon vanilla. We then blended the two back together to create this delicate, yet robust dessert stout that we are proud to share with you to celebrate 7 years of beers. The mixtape of beer love plays on with Secret Track. This experimental Hazy Pale Ale resulted in an extrememly hoppy lovechild with roots in unexplored German territory. 100% German hops and malts makes for a powerfully hoppy, refreshingly bitter pale ale with tons of fresh citrus fruit, juxtaposed with some noble greenery. Both beers are available now at Coal Harbour, and soon at select private liquor stores throughout the province.